"ShwakeUp" is an alarm clock that you have to shake to stop the alarm! To stop alarm is a little more difficult than the normal one. Your action of shaking clock prevents you from falling back to sleep, so we recommend the sensor sensitivity for set as a little low sensitivity. An alarm rings at a scheduled time. When the shake frequency displayed on the screen, the number is reduced to "0", alarm stops. You can set an alarm time, number of shake, sensor sensitivity, and favorite sound. 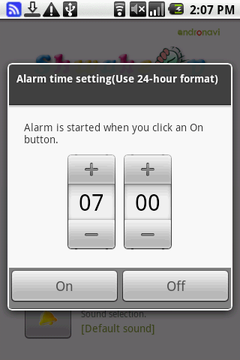 To change the alarm time, touch the "Alarm" button. To change the shake times, touch the "Shake" button. This number is used for count down to stop the alarm. The shake level shows strength of the shake. To change the shake level, touch the "Shake level" button. 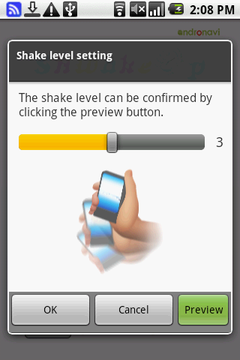 To Confirm the strength of the shake, move "Shake level test" screen by tap "preview" button. You will go back this screen from "Shake level test" screen by shaking need times or tapping "STOP" button. 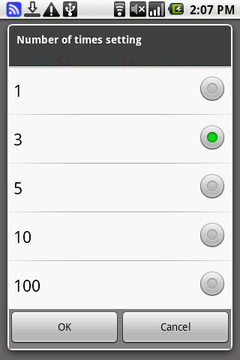 You can choice a alarm sound (MP3, WMA, ...) in SD card. To change alarm sound, touch the "Sound" button. To tap alarm name in the list starts trial listening. 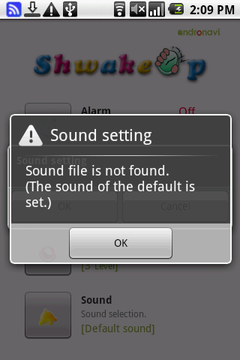 If no sound file in SD card, "ShwakeUp" uses default ringtone as alarm sound. It displays the version of application.